It seems as though we have been gone for quite a while. The summer and fall were so jammed packed with activities that we just didn't have time to update our website. Well we are back in the saddle and want to let you know what has been going on since early summer. Our environmental day camp went well. Not as many children as we had hoped but the ones that attended were really engaged and have even asked if we will have camp next year! 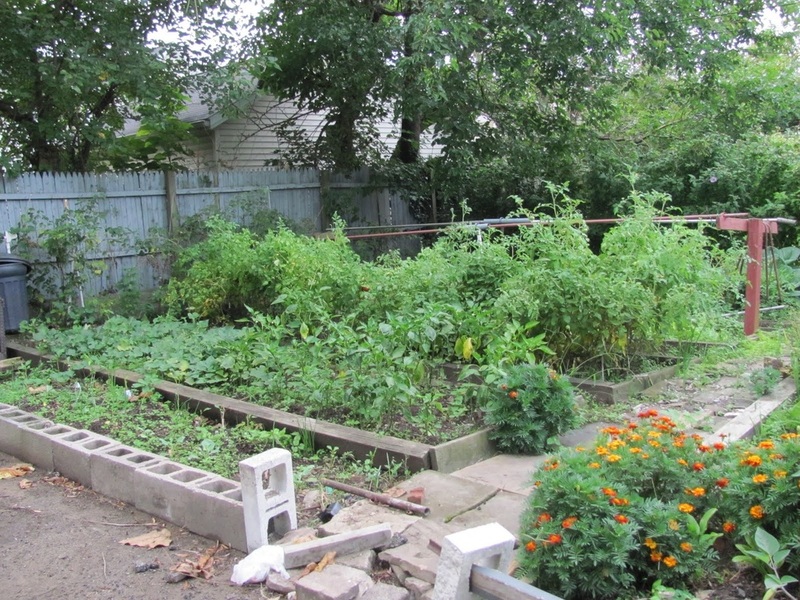 City Rising Farm once again participated in GardenWalk Cleveland. The two day event was fantastic! It gave our environmental day campers the opportunity to show off their hard work and enhance their presentation skills. We were pleased to see so many people come out! We had wonderful experiences with volunteer groups this summer. Business Volunteers Unlimited sponsored the Summer of Service and we were fortunate to have volunteers from Medical Mutual build and plant beds at the Permaculture Education site. 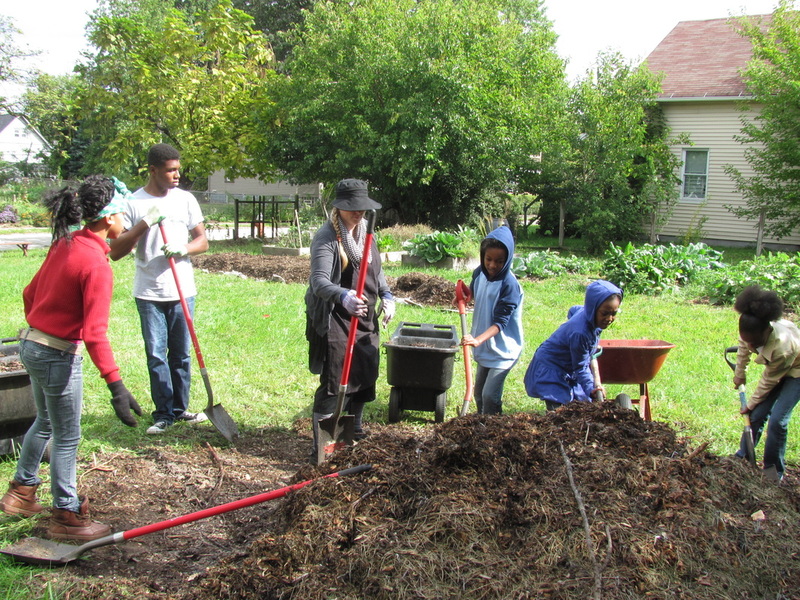 The Cleveland Wwoofs program provided an opportunity for City Rising Farm to serve as a host site for people around the country to learn and work with us. We enjoyed the time Jenny, Andy, and Ashley spent with us! The USDA High Tunnel Program is now in Cleveland. City Rising Farm is a recipient of one of the grants. Thanks to the hard work, vision, and support of Congresswoman Marcia L. Fudge many high tunnels will be installed at urban agriculture programs including community gardens around Cleveland and it's inner ring suburbs. That will provide opportunities not just for more fresh local food in the region but for increased education regarding healthy food choices. We are especially proud that our mentor, fellow urban farmer and community gardener Mr. Avon Standard's Regent Park Garden was chosen as the site for the ribbon cutting ceremony of the USDA High Tunnel! The last white pumpkin was harvested from the keyhole bed that was created by our wonderful Tri-C Upward Bound students this summer. We were able to share lots of food from that productive bed this year. We can't wait to see what the students have in store for the space in 2013! Menu For The Future brought us an opportunity to meet new people and build relationships with the staff and patrons of the Thurgood Marshall Recreation Center in Hough. Through conversation initiated by our Menu For The Future sessions we determined the need for small businesses right in our neighborhood. A coffee/sandwich shop coupled with a training program for residents was the outcome. We will be working to make that a reality and invite anyone interested in helping to join us. Sustainability 2019 gave us an opportunity to meet other liked minded people in local foods. We were proud to be a part of the first ever citywide Potluck in the Park. Many thanks to everyone who participated! Our special thanks goes out to Loretta Williams who cooked the greens from our market garden to perfection! Well it's time to get busy...lots of work ahead. WHOOOSH! There he is flying in to head up converting a vacant lot into a Naturehood garden. POW, he’s packing some punch into the lessons at a permaculture education site by teaching students how to create a keyhole planting bed. BOOM...he has created an explosion of excitement while instructing students in seed starting during Souper Saturday workshops at the library. KAZAM! Josh has swooped in to teach exciting hands on lessons on pollinators at an environmental day camp. 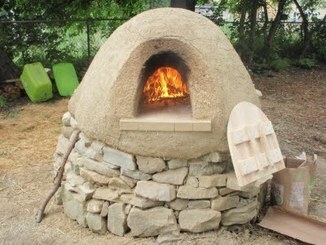 Whether he is working on a team that puts on permaculture workshops at the botanical garden or leading a diverse group of people in a series of cob oven building workshops you will find Josh Koppen and/or his work just about anywhere in the City of Cleveland. So I ask again…Have you seen Josh Koppen? Chances are you have. In the rare case you haven't you most definitely have seen his work. 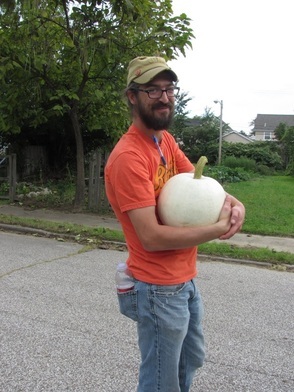 Josh is a board member of Green Triangle, Inc. the permaculture design non profit right here in Cleveland. Josh is an instructor in natural building. 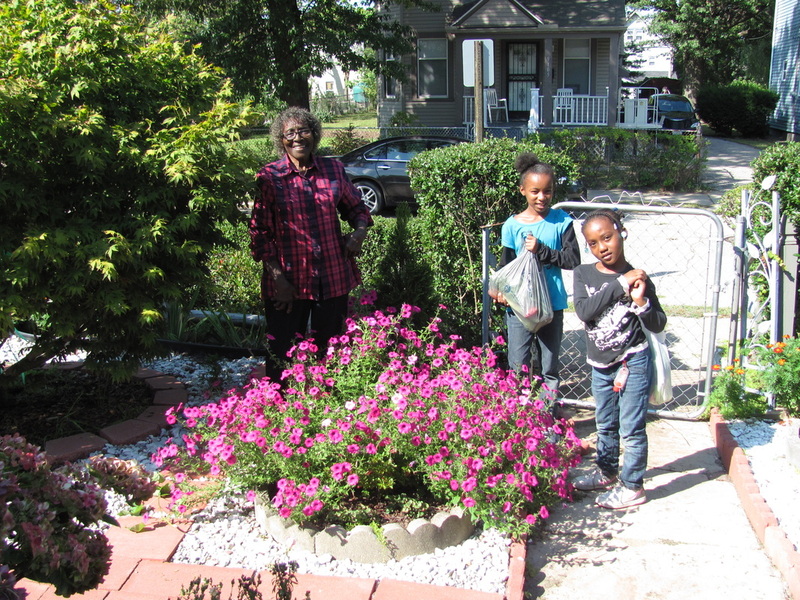 Josh is a core consultant to the NatureHood Program showing people how to convert vacant lots with native plants. 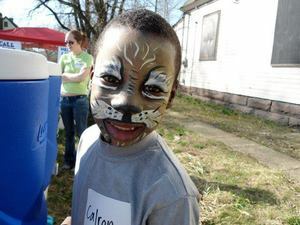 Josh is also part of the City Rising Farm team bringing environmental education to the Hough Neighborhood of Cleveland and other areas that we service! 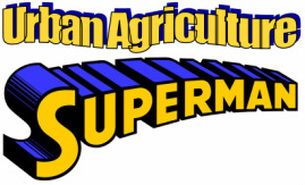 In fact Josh Koppen is our Urban Agriculture Superman! Along with those superhero urban agriculture education skills Josh is an artist with a heart of gold who we are proud to call friend. He has the extraordinary ability to engage people and make them feel special and important. So when you are visiting urban agriculture projects around the City of Cleveland be on the lookout for Josh Koppen’s work or the Urban Agriculture Superman himself! Neither will be hard to find!! Kazowee! Josh is off again, native plant seeds in hand destined for a garden near you!! Enjoy some of Josh's links listed below. Join us as we explore the natural phenomena of hibernation in plants as we focus on bulbs! Our Souper Saturday at the South Branch of the Cleveland Pubic Library was another great success. We learned about different cultures and how they celebrate the "Season of Light". 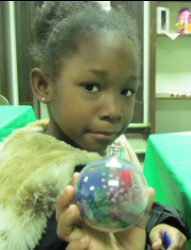 The holiday ornaments were a tremendous hit! Everyone had the chance to make three different ornaments; orbs filled with natural materials, yarn and popsicle stick god's eye and the popcorn and cranberry garland. Our dynamic duo, Josh and Lara made the pumpkin and squash soup with roasted pumpkin and sunflower seeds for garnish. It went fast as did the fresh green salad with garden greens, cucumbers and dried cranberries. There was so much fun and learning going on that we forgot to get a group picture. Never fear though, listed below is the link to the many photos we did take at this wonderful workshop. 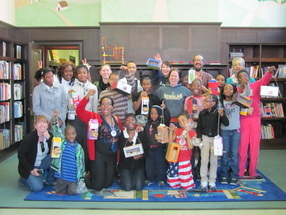 We kicked off our westside Souper Saturday at the South Branch of the Cleveland Public Library on November 10th. It was all about birds, their habits, migration patterns and most of all how and what they eat and how we can help keep them fed during the winter months. Everyone made bird feeders and got a bag of bird seed to take home. They received a bag of kid seed (popcorn,pretzels, candy covered chocolate pellets) as well! We are glad that the birds that travel through our community on their way to their winter homes and those that remain are going to be well fed this season! Of course it wouldn't be Souper Saturday without some great food. Ms Alisa's crowd pleasing potato cheese soup was a hit as was the fresh cut watermelon and salad greens grown by the Hough Home Grown Environmental Day Campers. Check out our pictures at the link below. 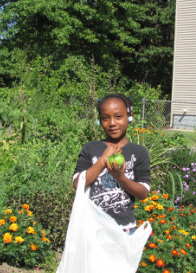 Cleveland Wwoofs Yields Ongoing Relationship for City Rising Farm! 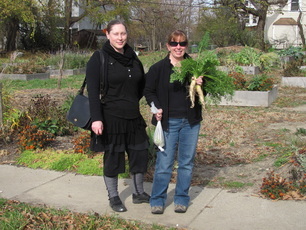 Cleveland Wwoofs turned out to be an extraordinary opportunity for us at City Rising Farm. The program managed by Neighborhood Progress Inc. gave us the opportunity to share our program with people from around the country who also shared their experiences with us. As a result we have established a strong and hopefully long relationship with Jennifer Malloy and Jeanne Ryan of Chicago. Jennifer has made several trips from Chicago to work with us, most recently at the Souper Saturday kickoff at the South Branch Library. She brought Jeanne along for that trip. This collaboration proved extremely fruitful. 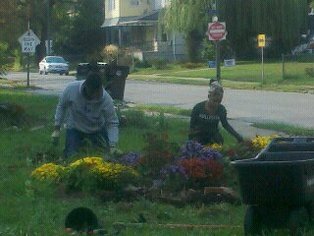 Our youth came to the gardens looking for "Ms. Jenn". It was fun to watch their expressions as we explained that Ms. Jenn couldn't come every weekend because she lives in Chicago. Thanks to Jennifer and Jeanne for providing assistance and lots of fun to City Rising Farm and also to Colby Sattler, Lilah Zautner and the rest of the Neighborhood Progress, Inc. team for bringing "wwoofing" to Cleveland!! This is proof that new and innovative programming can yield much more than is expected!! Please contact Colby Sattler with any questions on Cleveland Wwoofs.